Grogan and Company Fine Art Auctioneers and Appraisers' next sale on December 11 will offer a Fine Collection of Classic Chinese Furniture, Chinese Decorative Works of Art and Textiles; American and European Paintings, Drawings, Prints and Sculpture; and Oriental Rugs and Carpets. The auction will begin with more than 200 lots of Chinese Furniture, Works of Art, Textiles and Scroll Paintings. Highlights of this varied collection of Chinese works of art include an important collection of classic Chinese furniture consigned by J. Malcolm Swenson of Hanover, New Hampshire. Mr. Swenson developed a keen interest in Chinese culture and design in the 1970's while serving as an advisor to the Chinese government on China's construction and development. Following his work in supplying and installing the granite walls for China's United Nations Mission Building, Swenson continued to consult as a "foreign expert" on the technical advancement of China's building projects. 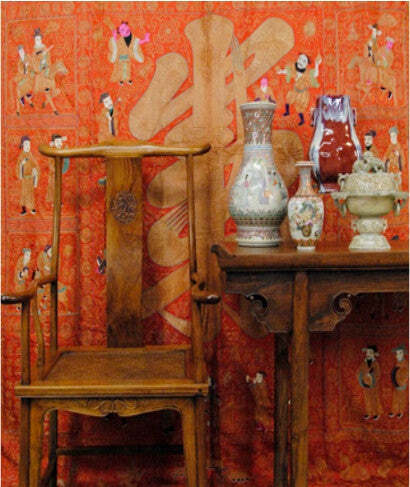 While living in China, Swenson collected Chinese rugs, scholar's objects and furniture with the assistance of Mr. Cui Wei Lian, a director of the Beijing Hardwood Furniture Factory. Much of Mr. Swenson's collection was exhibited at the Kimball-Jenkins Estate in Concord, New Hampshire in 2004. Highlights of the Swenson Collection of Classic Chinese Furniture include a pair of 17th century Huanghuali High Yoke-backed Armchairs with a presale estimate of $60,000-90,000; a pair of 17th/18th century Huanghuali Woven Seat Folding Stools, estimated at $40,000-60,000; an 18th century Huanghuali Corner Leg Table, estimated at $40,000-60,000 and an "Official's Hat" Armchair, estimated to bring $20,000-30,000. In addition to these fine classic examples of Chinese furniture, the auction will include examples of "Vernacular" furniture from a Maine Collector. "Vernacular" furniture was made for and utilised by the general populace of China as opposed to "Fine Classic" furniture which was made for the more prosperous classes. Examples of "Vernacular" furniture include a pair of Elmwood and Black Lacquer Armchairs, estimated at $2,500-3,500 and an Elmwood and Brown Lacquer Long Table, estimated at $4,500-6,500. Both lots were exhibited at the Peabody-Essex Museum's "Friends of the House: Furniture from China's Towns and Villages" Exhibition held in 1996 and were formerly in the collection of the renowned 20th century Chinese artist, Zeng Xiaojun. Chinese porcelain and pottery highlights include two Qing dynasty Hu form vases, both from private Massachusetts collections, estimated to fetch $2,000-4,000 and 3,000-5,000 respectively. An auction exhibition will open to the public on Thursday, December 8. Grogan and Company's gallery located in Dedham, Massachusetts.